NOTE— This Notice of Race is for Inshore Races—boats 30 ft. and under. However, boats 24 ft & under are preferred, since boats over 24 ft. are encouraged to participate in the offshore events. The St. Augustine Race Week Inshore Series is two days of Inshore Racing, March 28th & 29th, 2019 with multiple races each day on the Tolomato River North of the Vilano Bridge. Race courses will be set between River Markers 57 and 55. Race Week includes Live Entertainment, Drinks and Food in and around the Race Week Event Tent. The final awards party will be held Saturday evening, March 30th at the St. Augustine Yacht Club. An associated Youth Regatta (separate NoR/SI) will be held March 23rd & 24th off the downtown Bayfront quay on Saturday and Sunday. A Competitor’s Meeting is scheduled for 1900 March 27th at the St. Augustine Yacht Club. 1 RULES First Coast Sailing Association (FCSA) is the Organizing Authority for St. Augustine Race Week. 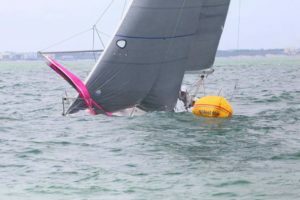 The Regatta shall be governed by the “2017-2020 Racing Rules of Sailing” (RRS) as amended by the US Sailing Prescriptions; the PHRF rules of the FCSA (http://www.sailjax.com ); and class rules for any One-Design class established. 3 FEES The Regatta Fee of $150 + tax will cover two days of racing; four Event Passes for Thursday and Friday including Drink Tickets; two Awards Dinner Passes for Saturday at SAYC; and a Skipper’s Bag with Regatta Hat and Shirt, local Discount Coupons and other Goodies. This discounted early-registration fee includes a Race Week polo shirt of the skipper’s choice. The regular registration fee, after January 28th is $175 + tax. Withdrawals after March 10th will forfeit $60. No refunds will be made for withdrawals after March 17th. Entries tendered beyond that date are subject to the discretion of the Race Committee. Additional Award Dinner Event Passes are available for $25 + tax. 4 ENTRY FORMS AND OTHER DOCUMENTATION Prior to racing, each yacht shall be registered and shall submit (1) the proper Fee; (2) a Crew Declaration form including a landside emergency contact (which may be updated at the Competitors’ Meeting); and (3) a copy of a current PHRF certificate or similar (if not issued by FCSA) for possible adjustment to conform to FCSA ratings. Register and obtain forms by selecting the Blue “CLICK TO REGISTER” Button on this website www.StAugustineRaceWeek.com or from the link at http:/www.sailjax.com. Class 1 will consist of lighter boats including daysailers and sport boats. Class 2 will consist of heavier displacement boats. Yachts using performance sail materials (non-Dacron) cannot compete in Class 2. The Race Committee reserves the right to assign any boat to a particular Class or combine classes as necessary. 6 PRIZES Trophy Flags for individual races will be awarded for 1st, 2nd, and 3rd place finishers in each class or division of class. Regatta trophies will be awarded for overall 1st thru 3rd place in each class. 7 SAILING INSTRUCTIONS Obtain sailing instructions and scratch sheets from the regatta website or at the Competitors’ Meeting. My next boat . . . The St. Augustine Race Week Regatta includes Offshore and Inshore Sailing with the historic city of St. Augustine as the focal point. Offshore courses are approximately 30 minutes from most St. Augustine Marinas. The races will include multiple W/L triangle offsets for the Performance Classes Thursday, Friday, and Saturday March 28th, 29th & 30th (Mariners Triangles). Cruisers will race Thursday, Friday, and Saturday March 28th, 29th & 30th. Cruiser Class races will include the Conquistador’s Corner (to and from a prescribed intersection of latitude and longitude), and Menendez Meander (out from the coastline to the North and to the South). An associated Junior Regatta will be held off the downtown Bayfront quay on Saturday and Sunday March 23rd & 24th. Race Week includes Live Entertainment, Drinks, and Food in and around the Big Party Tent. The final awards party is held Saturday evening March 30th at the St. Augustine Yacht Club. A Competitors’ Meeting is scheduled for 1900 hours on Wednesday March 27th, 2019 at the St. Augustine Yacht Club. 3 FEES The Offshore Regatta Fee of $250 + tax covers 3 days of racing; 4 Event Passes for Thursday and Friday including Drink Tickets; 2 Awards Dinner Tickets, and a Skipper Bag with Regatta Hat and Shirt, local Discount Coupons and other items. Registrations before Jan. 27, 2019 can receive a SARW 2019 Polo Shirt. Registration fee after 1/27/19 is $295 + tax. After 3/23/19 registration fee is $350 + tax. Withdrawals after 3/13/19 forfeit $100. Withdrawals after 3/20/19 receive no refund. Entries beyond that date are subject to the discretion of the Race Committee. Additional awards dinner and event passes may be purchased for $25 + tax. 4.1 The Offshore Series is open to all seaworthy self-righting cruising sailboats that are not less than 24 feet in length. Smaller boats not less than 20 feet may be eligible on an individual basis at the discretion of the Race Committee. Non-seaworthy sailboats, and those less than 30 feet are eligible for Inshore Racing. 4.2 The designated skipper shall be 21 years of age or older. 4.3 Minimum crew size shall be 2 (including skipper). 4.4 All One Design Classes shall comply with the maximum crew numbers in their class rules. 4.5 There will be no restriction on crew changes between races. Children aged 14 and under will not count as crew. 4.6 Modifying RRS Appendix G, a yacht should have identifying symbols on each mainsail, spinnaker, and headsail having a clew that can extend behind the mast 30% or more of the mainsail foot length. The identifiers should be the same for each sail used. a) Radio – a 5 watt minimum VHF transmitter / receiver with a manufacturer’s recommended antenna (masthead preferred). The radio must at least be capable of tuning to channels 9, 13, 16, 22A, 68, 69, 71, 72, and 78A. b) GPS – a GPS device at least capable of displaying real-time latitude and longitude location data. 5 SELF-STEERING Cruising Class yachts may be sailed with assistance of self-steering gear, electric or wind (modifies RRS 52). 6 ENTRY FORMS AND OTHER DOCUMENTATION Prior to racing, each yacht shall be registered and shall submit (1) the proper Fee; (2) a Crew Declaration form including a landside emergency contact (which may be updated at the Competitors’ Meeting); and (3) a copy of a current PHRF certificate or similar (if not issued by FCSA) for possible adjustment to conform to FCSA ratings. 7 CLASSES AND DIVISIONS One PHRF Performance and two PHRF Cruising Classes (A and B), each sub-divided into Spinnaker and Non-Spinnaker Divisions; also Multi-hull and One Design Classes as appropriate. Five entrants are required to establish a Class or Division. Yachts using non-Dacron sail materials must compete in the Performance Class. Cruising spinnaker yachts must declare prior to the Competitors’ Meeting, with the FCSA standard rating adjustment applied for all races. 8 PRIZES Trophy flags for individual races will be awarded for 1st, 2nd, and 3rd place finishers in each class or division of class. Regatta trophies will be awarded for overall 1st thru 3rd place in each class. A trophy will also be awarded to the FCSA Member Club with the best overall performance. 9 SAILING INSTRUCTIONS Obtain SI’s and scratch sheets from the regatta website or at the Competitors’ Meeting.